The mystery, color and romance of pre-war North Africa comes to life in Casablanca style. Inspired by the Moorish architecture of Spain, Morocco and Tunisia, Casablanca incorporates the classic design elements of Moorish-style arches, loggias, courtyards, and window openings, creating a style reminiscent of the grand stone, tile and clay architecture of the western Mediterranean. The font, with its boldness and embellishments, evokes the moorish calligraphy of the mediterranean. This is a style for a sun-drenched outdoor garden party or other event. Customize your Casablanca bath and body tags today! 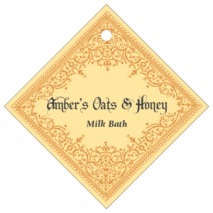 Casablanca bath and body tags are printed on one side and are blank white on the back. You have the option to add text on the back for a small charge—just ask! Bath and body tags are printed on extra-thick cover weight white paper and come in a variety of shapes and sizes, including square, circle, heart, a scallop-edged circle, ovals, and other shapes. Bath and body tags come pre-punched with a small round hole to thread your choice of tying material. They are punched out individually and packaged as a set in small bags. 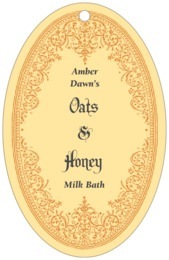 Just choose a shape from above and then select "Personalize" to create your custom Casablanca bath and body tags.